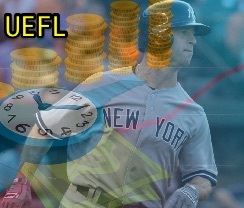 Major League Baseball's practice of fining repeat pace-of-play violators isn't sitting well with at least one player, as Brett Gardner of the Yankees told Newsday of a recent letter from MLB Chief Baseball Officer Joe Torre informing him of his most recent monetary fine, which reportedly brings Gardner's total to six pace-of-play violations. Gardner is unhappy about MLB's fines. Unlike the NBA's disciplinary system, which publicly discloses fines issued to players—most basketball fines these days are due to technical fouls—MLB, perhaps due to its collective bargaining agreement with the players' association, keeps specific dollar amounts under wraps. For instance, a third-party MLB Fines & Suspensions page, hosted by USA Today partner Spotrac, which also hosts the detailed NBA Fines & Suspensions page, takes only baseball's publicly announced suspensions and prorates the games missed over a player's yearly salary to estimate money lost. Fines alone are not announced—with the exception of certain high-profile cases, such as Ian Kinsler's $10,000 fine for his over-the-top post-game criticism of Angel Hernandez, which led to last year's World Umpires Association's white wristband protest, which in turn allegedly spurred MLB Commissioner Rob Manfred to threaten to start disciplining umpires who engaged in the wristband protest. As a result, the protest was dropped after one day. In 2015, the MLB & MLBPA jointly announced a warning-and-fine system for pace of play regulations, noting that discipline would be issued for "flagrant violators" while proceeds from these fines would be donated to the MLB Players Trust charitable foundation. The fines are not publicly specified. Related Post: MLB Releases Pace of Game, Replay Changes for 2015 (2/20/15). In short, if word about baseball's secret fines gets out, it's because the fined player has spread it. Gardner thus disclosed the otherwise-unspecified fines in an expression of exasperation: "My agent started taking care of it. I told them don't talk to me about it. I've got more things to worry about than taking three seconds too long to get to the box. Someone else can [attempt pickoffs] 27 times in a game and waste 15 minutes of everybody's time, and I get fined thousands of dollars taking three seconds too long to get in the box." 2018 featured some changes, but no clock. Meanwhile, Baltimore's Adam Jones said in an interview on MLB Network Radio that he was fined $50,000 during the 2017 season for pace-of-play violations. 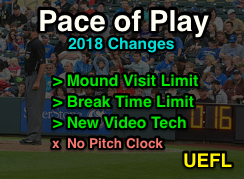 After assuring club owners that pace-of-play changes were coming during the November 2017 owners' meeting, Manfred later announced that baseball would not institute a pitch clock at this time, and instead allow the players to attempt to solve the pace-of-play issue themselves, introducing mound visit limits and tweaks to the existing inning break and pitching change clocks instead. Various statements at the time implied that if the players were unable to remedy the issue on the field, the league might step in with a pitch clock or other initiatives ahead of 2019 or other future seasons.